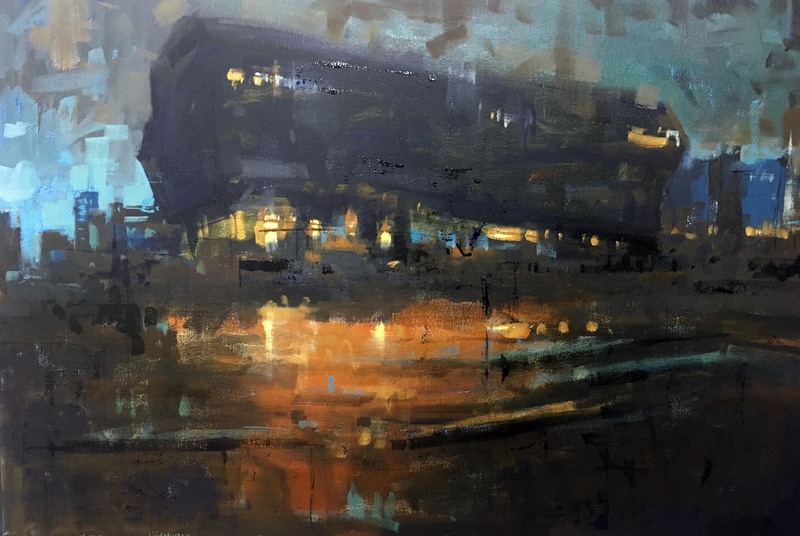 As a painter, tutor and resident artist at The Arches Southampton, Stewart Beckett develops his work in observation through drawing and painting. He conducts several classes a week in oil, acrylic and watercolour. 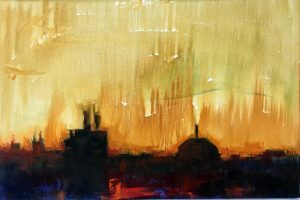 He is commissioned for paintings regularly, and hosts workshops and demonstrations throughout Hampshire. 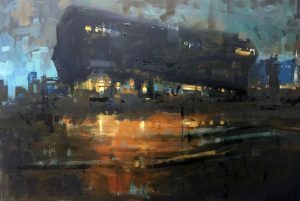 His work is generally impressionistic, verging on the abstract, with the feeling that vision is never one clear image, but a series linked together. It is a snapshot of this process, that his images strive to capture, pondering reality without prejudice. This exhibition at Turner Sims is inspired by a simple notion; that the transition from natural to manmade light is so seamless, expected and easy, that we don’t give it a second thought. Showing local structures bathed in varying degrees of light this series is graduated around the space from lightest to darkest. It ends in a painting of a great oak tree on one of Southampton’s greatest treasures, The Common. Depicted by night, it is a visual non-event which questions how we would lead our modern lives if we had to live in this kind of darkness after sundown. All works are for sale. Please ask Box Office (023 8059 5151) for further details. Prices range from £160 – £300.